If I think about some of the most beautiful game art, without filtering for specific styles of art or different types of games, Arboretum would easily be near the top of that list. The game is a simple, yet deceptively strategic, card game of set collection and tableau building. The size of the deck varies by the number of players, and the rules are simple. Strategy aside, the hardest part about Arboretum is learning how to pronounce some of the trees that you might never have written down before. Once you start the game, each player will take three actions, in order. Draw 2 Cards: The player draws one card at a time and may draw from the draw pile, or from the top of any player’s personal discard pile. Play 1 Card: The player must play one card from their hand, orthogonally adjacent, to any card already in their Arboretum. Discard 1 card: The player discards any one card from their hand into their own personal discard pile. The game continues like this until the last card of the draw pile is taken, at which point that player completes their turn as normal before scores are tabulated. Scoring can take a bot to wrap your head around. But I’ll try to break it down for you. The dealer will call out each species of tree off the score pad. 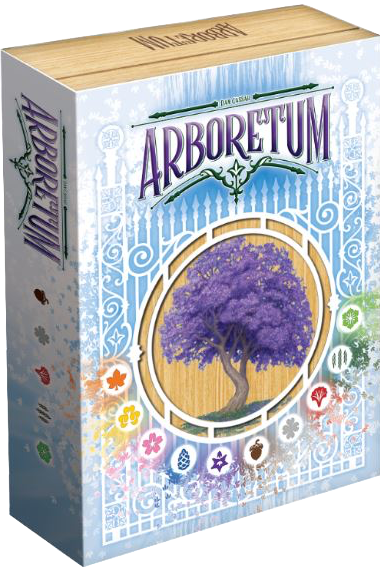 Each player reveals any cards of that species in their hand and the player with the highest sum of those cards wins the sole right to score a path for that species in their Arboretum. If there’s a tie, both players score, and if no one has that species everyone may score. (There’s an extra rule in this process that I’m skipping for simplicity.) It’s completely possible to earn the right to score a path you don’t have in play, blocking another player from scoring it instead. A path is an orthogonal sequence of cards that starts and ends with a specific species of tree (the cards in between do not have to be the same species). The sequence can go in any direction (including taking turns), as long as each card is a higher number than the previous card. Bonus points are earned for paths that start with a 1, end with an 8, and /or that contain only one species. Even though we were all pretty sure we knew what we were doing going into our first game, there were a lot of “Ooooooooh! I get how that works now!” moments as we scored the first time and our second game ran much smoother, and was a great deal more cutthroat. This one definitely has that elusive “gateway” quality to it, that allows it to be deep enough for “gamers” and light enough to get “non-gamers” to play and enjoy it as well. The only thing that limits it in that regards is the four player max, but maybe I’m the only person who has a hard time only getting four people together. This is a beautiful game, that runs fast enough that if you need to play a game for some of the strategies to click home in your head, you’ll still have plenty of time to play again. You can find Renegade Game Studios online at www.renegadegames.com or on Facebook at facebook.com/PlayRGS.